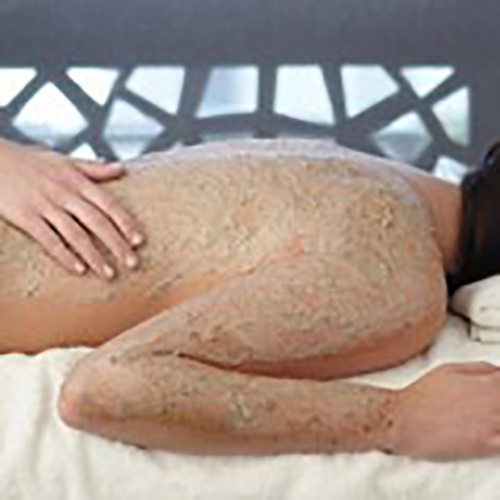 Body Exfoliation treatments are essentially a facial for your whole body. It is just as important to cleanse, exfoliate and hydrate the skin on your body as it is the skin of your face.. Relax & Rejuvenate Your Body. Streaming Warm Herbal Oil . Our skin is our largest organ. It protects us from the elements and is the first line of defence against dozens of things that we come into contact with on a daily basis. As such, skin needs some tender loving care from time to time. The skin regularly grows new skin cells and sheds dead skin cells which is the reason why we have to exfoliate. Body exfoliation products are commonly made with salt crystals or sugar crystals that are packed in some kind of skin-friendly oil such as olive oil or jojoba oil. These products also often include essential oils extracted from plants such as lavender or lemongrass. When the product is rubbed over the body, it helps to loosen and cleanse away dead skin cells, leaving behind fresh, healthy skin. There are also many treatments that include body exfoliation. In these treatments, the skin from the neck to the feet is scrubbed with an exfoliant, rinsed clean, and may also be treated with a body masque. These treatments, which can be very indulgent and relaxing are very effective at exfoliation.